I'm Sammy and I'm a Texas Longhorn Bull. I'm originally from Spain, but I eventually found my way to Texas. I'm famous in Texas, cause I'm the State Mammal! I'm so proud of my horns. Did you know that both boy and girl longhorns have horns? The largest horns ever measured were 10 ft. long! But don't worry, mine aren't that big. In nature, Longhorns come in many patterns and colors, just like me! I can't wait to "Roam the Range!" I promise to faithfully carry your Little's stuff and I'll ALWAYS have his or her back! 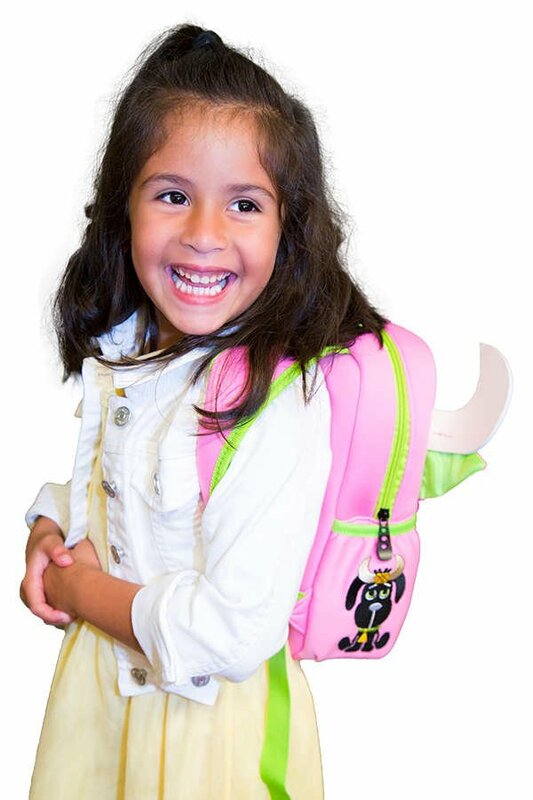 Sammy is the perfect "Little" Backpack for school, travel and fun outings! 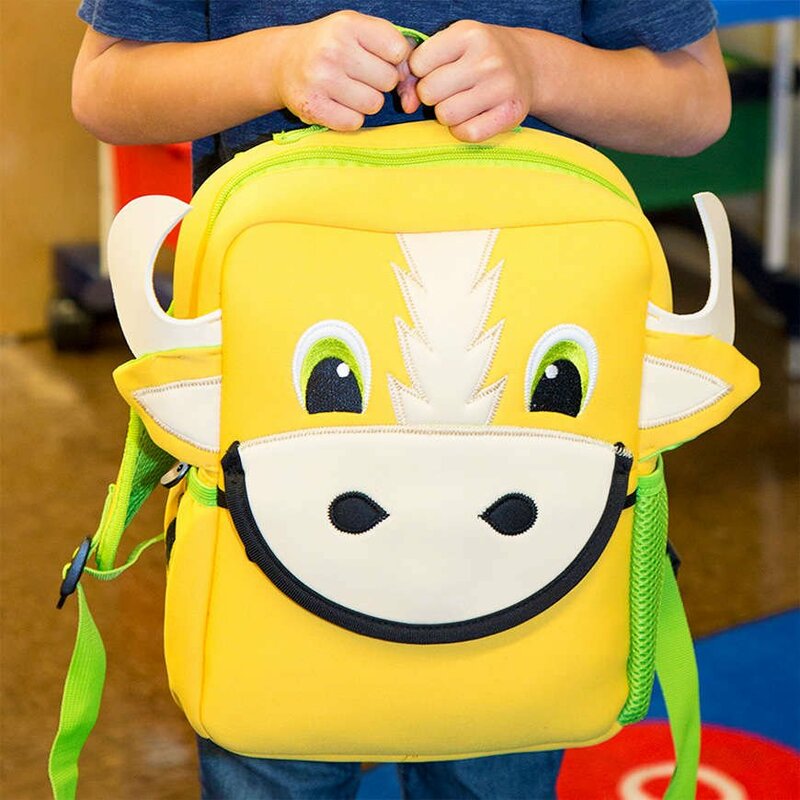 Sammy comes with a Removable Name Tag that is great for going to school or day-care, but easily comes off when it's time for travel. 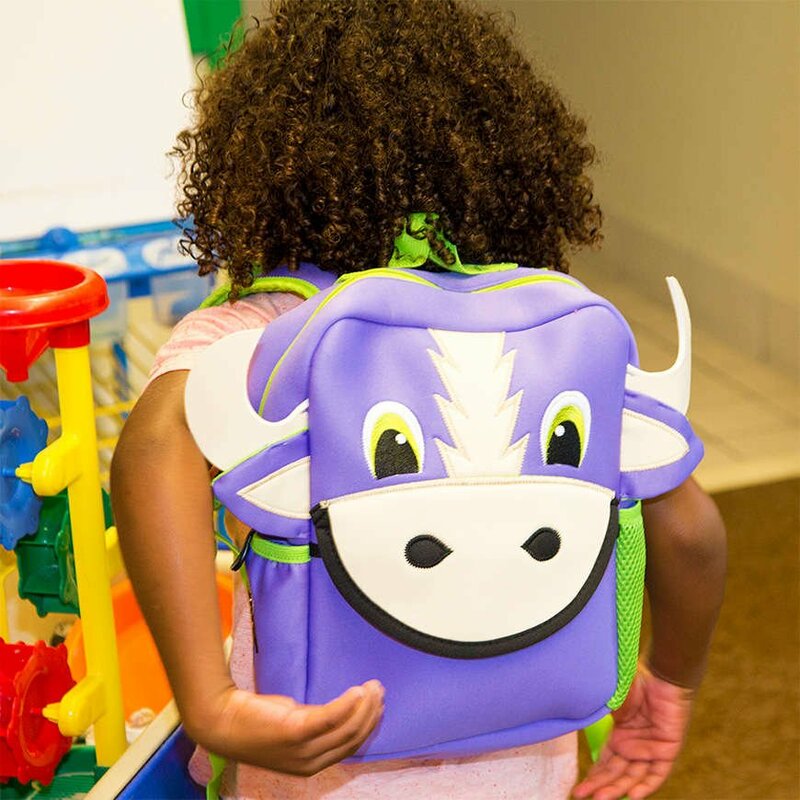 Sammy is both lightweight and made with the proper dimensions for Littles' backs. It's so lightweight, that your Little will forget she's carrying it. 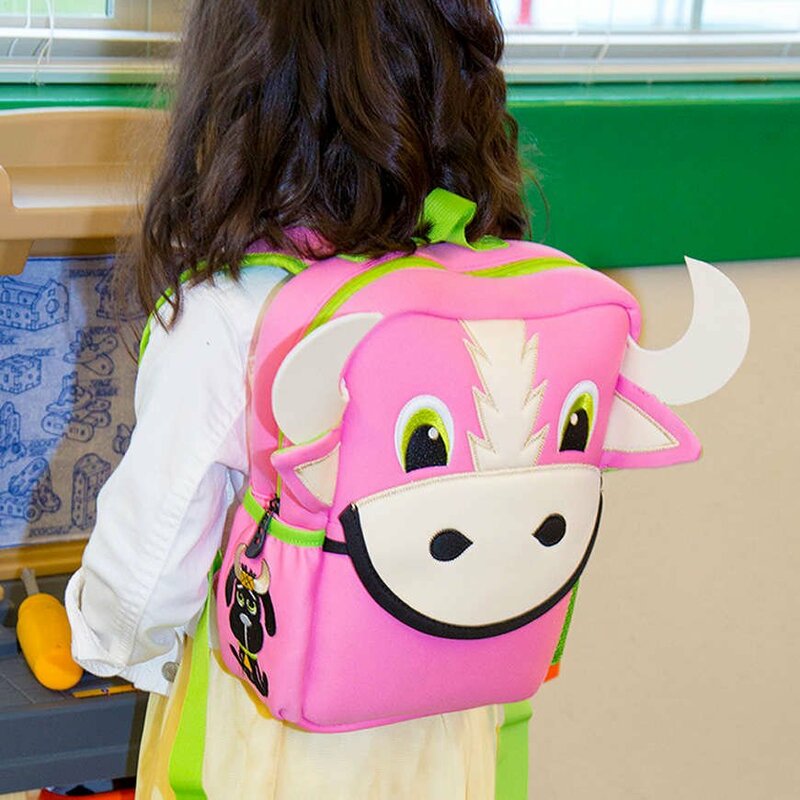 Padded, adjustable shoulder straps allow Sammy to fit properly and comfortably. The fabric we put on the back of the straps helps prevent slipping as your Little moves around. Quick, easy access to the most important things: FOOD!! Sammy's mouth covers a front zippered pouch for anything your Little needs to get to quickly.....which is usually snacks. Sammy's 2 side pockets are perfect for drinks and more snacks. 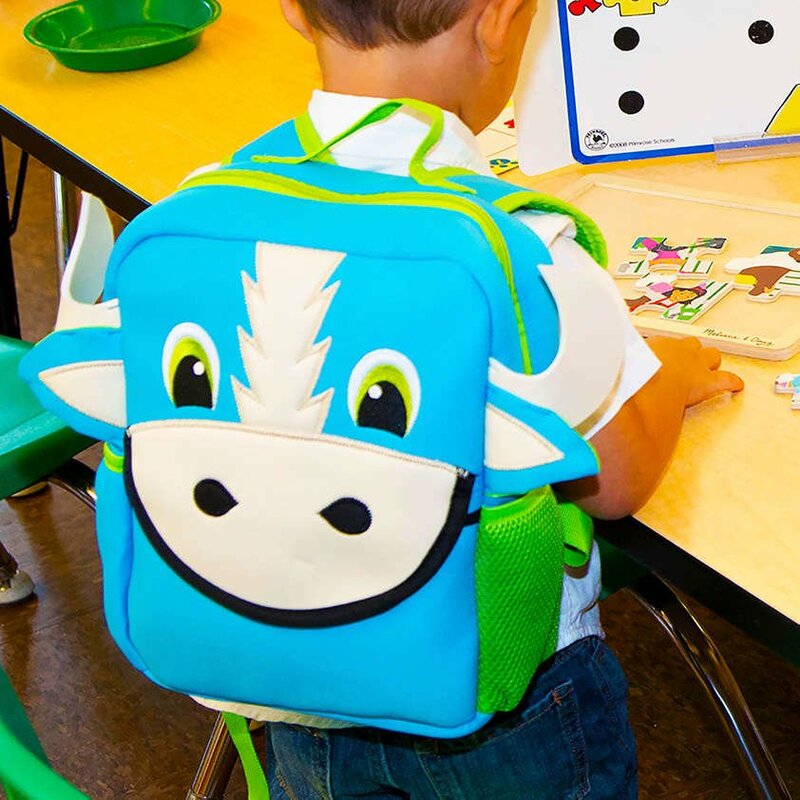 Washable materials AND the included "Care Bag" make keeping Sammy Clean a cinch! When it's time for a 'bath,' just put Sammy in the care bag and machine wash in cold water. Sammy has been tested to be BPA, PVC and Phthlate free. Howdy, Ya'll! I'm Sammy and I'm a Texas Longhorn Bull. I'm originally from Spain, but I eventually found my way to Texas. I'm famous in Texas, cause I'm the State Mammal! I'd love to 'roam the range' with your Little! I promise to faithfully carry your Little's stuff and ALWAYS have his or her back!